Examples of AutoFilter macros, for use with worksheet AutoFilters (only one allowed per worksheet). 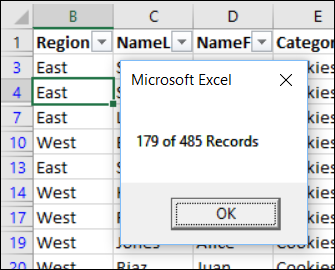 The following Excel AutoFilter VBA code shows all records, if a filter has been applied. If the worksheet is protected, with no password, use this code to unprotect it, show all, then turn the protection back on. If the worksheet is protected, with a password, use this code to unprotect it, show all, then turn the protection back on. 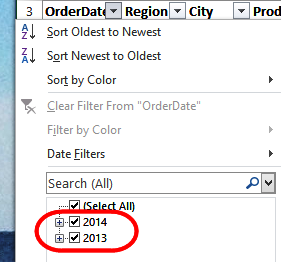 By default, when you turn on an AutoFilter, dates are grouped in the drop down list. Click on a plus sign, to see the months for each year. 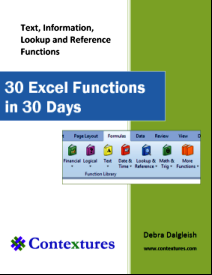 NOTE: If you have a copy of my Excel Tools add-in, use the Toggle Filter Grouping command on the Workbook Appearance drop down. Perhaps you want users to filter only specific fields in a list. 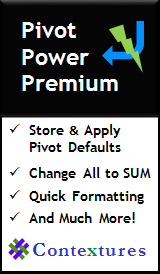 Use the following macros to hide one or more of the drop down arrows in the list heading row. NOTE: These macros do not turn the AutoFilter off. They just change the VisibleDropDown property to False, for some fields. The following Excel AutoFilter VBA procedure hides the arrows for all fields in the list. The Filter feature is NOT turned off. The following Excel AutoFilter VBA procedure hides the arrows for all fields except field 2. You can change the field number in the iShow variable, to leave a different field's arrow visible. NOTE: Use the Field number, NOT the worksheet column number. You can change the field numbers in the first Case statement, to hide different arrows. If one or more of the AutoFilter arrows have been hidden, use the following macros to show the drop down arrows in the list heading row. To show all the AutoFilter arrows again, use the following macro. 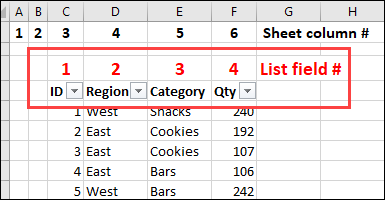 When the macro runs, it shows the arrow for each cell in the list heading row. The following Excel AutoFilter VBA procedure shows the arrows for all fields except field 2. You can change the field number in the iHide variable, to hide a different field's arrow. The following macro copies the filtered rows from the active sheet AutoFilter to a sheet named "Sheet2". You can use an Excel AutoFilter on a protected worksheet, but you can't create an Excel AutoFilter on a protected worksheet. Be sure that the filter is in place before you protect the sheet. To be sure that a sheet has an AutoFilter, and the sheet is protected, use a macro that runs automatically when the workbook is opened, and macros are enabled. This Workbook_Open macro checks for an AutoFilter on the sheet named Data. It turns on the AutoFilter, if one is not in place. Then, it protects the Data sheet, and sets the protection to user interface only. That allows macros to change the sheet, but users cannot make changes manually. 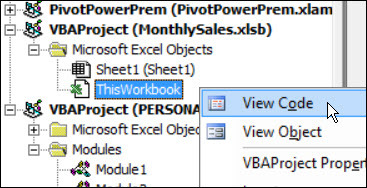 Store the following Excel AutoFilter macro on the ThisWorkbook module sheet. There are instructions below the code. To open the ThisWorkbook module, press Alt+F11, to open the Visual Basic Editor. 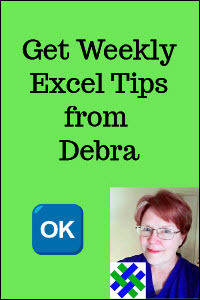 Then, in the Project Explorer at the left, find your workbook, and click the + sign to see the Microsoft Excel Objects. Then, paste the code where the cursor is flashing. With this Excel AutoFilter VBA sample code, show a message with a count of the rows that are visible after a filter has been applied. .Rows.Count - 1 & " Records"
To see if a worksheet contains a worksheet AutoFilter, run this macro. 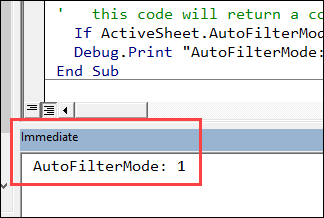 If there is a worksheet AutoFilter on the active sheet, this code will print a line in the Immediate window, with a count of one. You could use this type of code in other macros, to check a specific sheet for an AutoFilter. 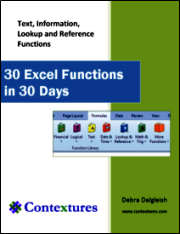 Note: While you are in the Visual Basic Editor, press Ctrl+G to show the Immediate Window. To see all the macros from this page, download the AutoFilter Worksheet Macros workbook. The zipped file is in xlsm format, and contains macros. Be sure to enable macros when you open the workbook, if you want to test the macros.